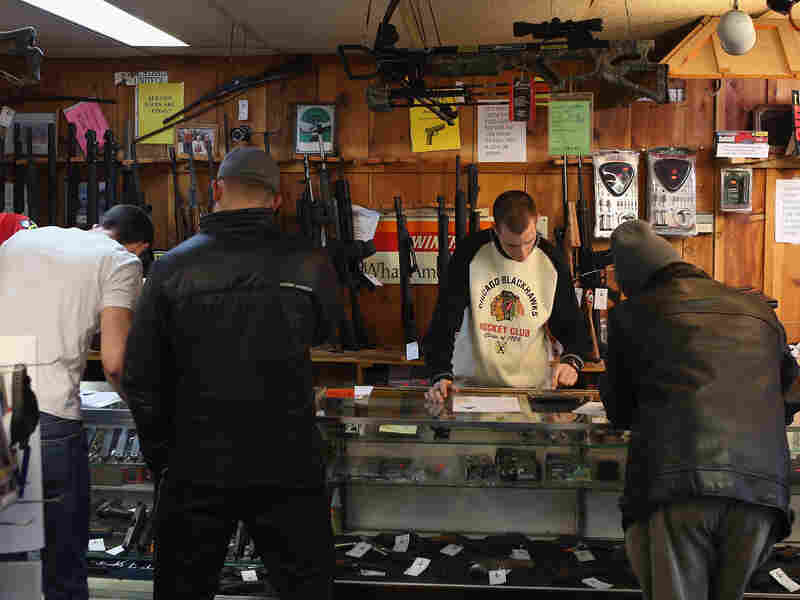 Customers shop for guns at Freddie Bear Sports sporting goods store in Tinley Park, Ill., in January. One of the gun provisions in the spending bill prevents the Justice Department from requiring gun dealers to conduct an inventory to see if guns are lost or stolen. The House voted overwhelmingly Thursday to approve a temporary measure to keep the government funded through the end of September. Government shutdown averted. The National Rifle Association didn't respond to a request for comment, but the group is the driving force behind these provisions. One rider prevents the Department of Justice from requiring gun dealers to conduct an inventory to see if guns are lost or stolen. Another requires the Bureau of Alcohol, Tobacco, Firearms and Explosives to make it clear that any data from criminal traces on guns can't be used to draw broad conclusions about firearms-related crime. A couple deal with curios and relics — collectible guns. Sen. Richard Blumenthal, D-Conn., says the provisions "restrict inventorying, information gathering, other practices that combat gun violence." Blumenthal is pushing for new gun controls and changes to make it easier to enforce current laws. He's no fan of these riders. But he voted for the continuing resolution anyway. "We were told that there was really no practical hope of changing the law this time, but next time, we will certainly be more aggressive than we have been this time," he says. On the House side, Democratic Rep. Carolyn McCarthy of New York has been fighting these provisions for years, but she, too, voted for the spending bill. "What's tough on this particular vote is do we shut the government down?" she says. Lawmakers like McCarthy who oppose these riders are up against a powerful lobby, as well as congressional inertia: The riders have functionally been the law of the land for years, and it would take an active effort to remove them. And in the case of the continuing resolution, negotiators had agreed to the riders before the Newtown shooting more than three months ago.